Hi, welcome to my official first instructional book, “Neoclassical Shred 101”. In this book I will be going over some great licks that make up this style and I will also be covering some common scales/modes used in this amazing style. Some notable players of this great genre are the influential Yngwie Malmsteen, Randy Rhoads, Joe Stump, Gus G, Jason Becker, Michael Angelo Batio and hundreds more. In this book you will learn 22 amazing Neoclassical shred licks. This book is complete with PDF tab, text explanation, and audio demonstrations. If you want to learn the licks of the masters, become the next Yngwie, or just impress your friends, this instructional product is a MUST! You are an intermediate or advanced metal guitar player looking to get some new ideas and intense licks into your solos. You are fascinated by Yngwie, Jason Becker, & Joe Stump and would like to learn the flaming licks they use. You want to improve your current level with some flashy and impressive virtuoso licks. Learn These AMAZING Licks to Fire Up Your Playing! 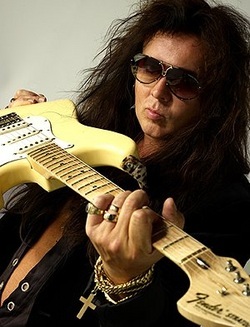 Learn Yngwie's Amazing Speed With These High Intensity Alternate Picking Licks! Learn Jason Becker's Fluidity With Some Intense Arpeggios! Learn Randy Rhoads' Exotic Trill Effect! Learn Gus G's Perfect Picking Techniques & His Amazing High Speed Licks! “Neoclassical Shred 101” will inspire you and give you the licks and techniques needed to get started and start dominating the fretboard in the style of the Neoclassical Gods. If you have ever wanted to play like the Shrapnel Guys, YJM, Jason Becker, Gus G., MAB, Rusty Cooley, Randy Rhoads or Joe Stump, invest in your dreams and get started TODAY with this product! Make other people turn and look at you when you play and start impressing some pro's. What are you waiting for?! You MUST get started NOW!